Can I suggest something from the current kickstarter? It would be great if the Gennifer Bone monster illustrations and the Jenna Fowler spell illustrations were available. Probably not likely, though, given the time frame, right? Core rules book, page 11, picture of adventuring party. Because that is where this all starts - it's about the group. Complete rules, page 114, troll. This has always been an iconic monster to me and I love this depiction. The troll is a widely recognized Hadassah, and the first time you encounter one and learn it has regeneration...well, it is memorable. Magic User, S&W: Core rules, 1st Printing, p. 16 -- because it depicts a magic-user in somethings besides the traditional robes and pointy hat. The Cleric, as I posted above, I should have noted as being the the 2nd Brave Halfling Press 2nd Printing ... just in case it makes a difference. The picture appears in other S&W rule books IIRC, but this is the first instance I found. Excellent suggestion with the Magic User. I was just looking through the first printing and was going to suggest the same. Whatever you choose I think it should be simple and black and white. Keeping with the light theme and easy to print. Cleric Healing pg 24 Core Rules Book. What is that first picture you posted above, with that strange dragon-thing? It's amazing. Not sure on page count and layout on the rules lite version, but I figured I would list all the art that I really liked - maybe others do too. I don't have a copy of the Otus cover printing but plan to pick it up with the Kickstarter 3rd printing add-ons. p. 98 - gotta have Orcus! p. 100 - and a dragon! This version of S&W is gorgeous. I love the cover. I thought Matt drew this himself. I love the two simple images on pages 21 and 22 of S&W (Core Rules): the various gear items and the various armors with AC scores. They scream of Old School manuals where gear was illustrated as if presented to be acquired and sometimes you'd end up buying something just because its illustration looked good. -Page 9: Adventurers approach ruined statue - It raises questions that hint at an adventure. Was the statue actually a stone golem? Why are the adventurers wary while the natives are relaxed? - Cover: Looting the giant skeleton - Reminiscent of both Erol Otus and the 1E PHB. Pg. 34 Not sure on area. Picture is of a five member party, two climbing on ropes while above them the other three are battling Stirges. Pg. 49 - Not sure what room it is, picture is of a bridge going to a sacrificial alter with a statue of Orcus behind it. Pg. 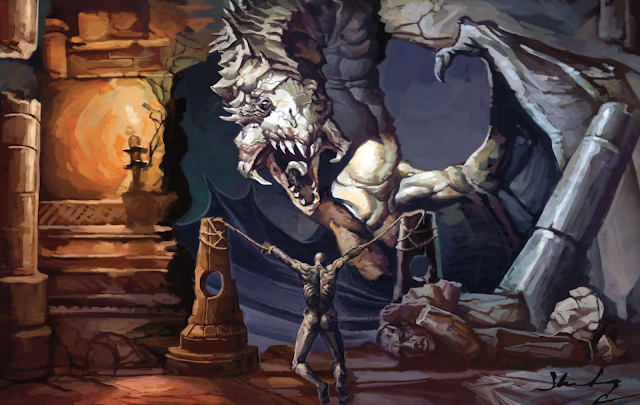 51 - Area 12 "Cavern of Orcus and Bronze Portals" Picture of giant stature of Orcus looming over a "rough black pit filled with bones of sacrifices." I love anything by Erol Otus, I've thought about getting the Core rules just to get that cover actually. So that is where my vote would go (though reuse of the art may cause some confusion). I suggest the dungeon exterior shot from p74 of S&W Complete 2nd Printing. It is clean. I don't like a lot of the shaded grey illustrations from Frog God Games because they are too muddy. The illustration invites me to ask a lot of questions: What are those statues and what do they mean? Are they statutes? Are those tombs opposite the dungeon? What creature does the skull come from? Is it real or a replica? Who used to live there? etc. etc. etc. This illustration has me hooked as a player to create a character to go explore it and as a Referee to answer all my questions as I design the dungeon depicted. In other words, it makes me want to play. 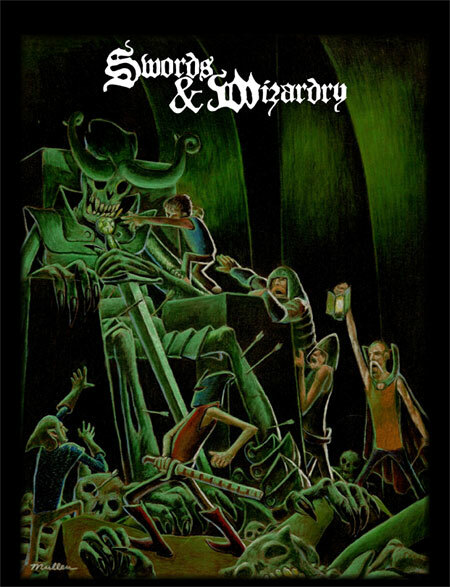 You cannot beat the giant, green skeleton on the original Swords and Wizardry book. Go with that. It was suggested in a previous comment up there, but I'll cast another vote for the Troll on pg. 114 of S&W Complete. It strikes me as a good all-around "monster" illustration when space is at a premium, and I think it would still be clear what it is even if the image is shrunk down a bit.